This is not your regular puzzle cache. The listed coordinates are not to the cache, they are to the geographic center of West Virginia. While researching some ideas for a cache, I came across several caches based on the original California Delorme Challenge by Haicoole. After doing a bit of investigation I decided to host a version for West Virginia. I have several partners on this that will be helping me with the logistics of tracking and verification of statistics. By the time you are finished you will have traveled all over the state, probably spent your family inheritance on gas, and said more than a few bad words about me for setting this up. This challenge is based on the DeLorme Atlas & Gazetteer which is published for all 50 states. If you don’t already own one, you’ll want to get one for this Challenge. It is a wonderful map book that I have been using for years with Boy Scouts, hiking, camping, biking, and now with geocaching. The state is broken into numbered sections. Each section number corresponds to a page number that contains the map to that area. 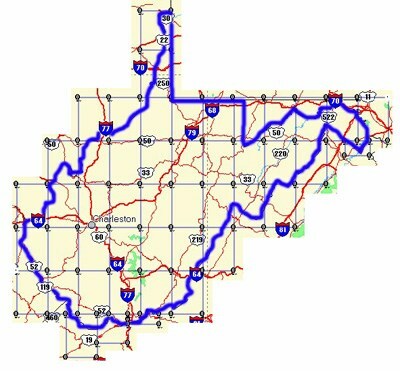 West Virginia has 44 pages with three of the pages having 2 map sections. In order to claim this cache, you must hide or find a cache on each map page as outlined below. Then send me a file containing all of your hides and finds in the state. (.GPX format is preferred or .LOC if you filter out your locationless, event and CITO caches ahead of time for me. At a minimum I need a list containing cache name, waypoint, and coordinates.) My partners and I will review the list and generate an image showing their locations in order to verify the list. Once everything checks out, we will then send you the correct coordinates for the final cache! The find cannot be logged until the physical container is found and the logbook inside signed. As mentioned above, the posted coordinates are not the actual coordinates for the cache. The actual cache may be quite some distance from these coordinates! To get the final coordinates, just complete the challenge! Generally accepted rules, guidelines and conditions for logging a cache find apply. These must be bona fide caches listed on Geocaching.com that you have personally (physically) found and logged. You may include caches found prior to the creation of the WV DeLorme Challenge so long as they meet all other Challenge requirements. Placement of a cache on a DeLorme Atlas page counts the same as finding a cache on that page, but only if it was placed prior March 01, 2006. Hides after this date do not count toward the Challenge. If a WV DeLorme Atlas page includes space not located in WV, only caches in the WV portion count. While you may have others with you when you find the final cache. Only those who have fulfilled ALL criteria for this cache will be allowed to log it as a find. Find logs by other cachers will be deleted. While the various editions and versions of the DeLorme Atlas do not seem to have changed much in terms of page boundaries, the image attached is derived from the information in the cache owner's copy will be considered definitive. Be safe and have fun! Use that WV DeLorme Atlas to head out into Wild and Wonderful West Virginia, find those caches, and discover why we say it’s Almost Heaven!